Roman Reigns and John Cena share a long history! Roman Reigns came out on WWE RAW this week to open the show. He had an announcement which he wanted to share with the entire WWE Universe with regards to how his treatment for Leukaemia was going. He came out and talked to the WWE Universe, informing them of how grateful he was for the outpouring of support he had received from them following his announcement about his illness. As if that was not enough, he went on to announce that the treatment had been successful, and his cancer was in remission. While the WWE Superstars all reacted to the news of his return, one huge name in WWE, 16-time WWE Champion John Cena also reacted to the news on Twitter, sharing his views with the WWE Universe and Roman Reigns. Roman Reigns shared an announcement with the WWE Universe on the 22nd of October, 2018, when he let them know that he was suffering from cancer. His Leukaemia was serious, and he needed to take a step back to fight against it. He relinquished his WWE Universal Championship and took time off from WWE. While there was news that his treatment was going well, there was no confirmed news about when the WWE Universe would be seeing Roman Reigns back in the ring again. So last week, when it was announced that Roman Reigns was going to return to the ring on this week's episode of WWE RAW, the entire WWE Universe was abuzz. While the entire WWE locker room reacted to the return of Roman Reigns, John Cena took his time before taking to Twitter to let the world know what he felt. John Cena took to Twitter and called Roman Reigns a Superhero, and that he was a real superhero who was back with 'strength and purpose'. He said that WWE was Roman's yard and that Reigns' time was 'now'. John Cena has often been called 'Super Cena' during his run in WWE, so coming from him, this was a huge compliment to Reigns. Reigns returning from cancer to be back in the WWE ring remains one of the most momentous occasions in WWE's history, and John Cena recognised that. 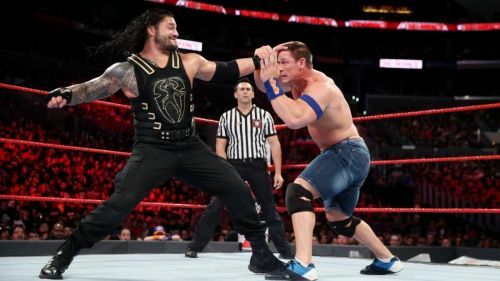 It will only be a matter of time before the 'Big Dog' returns to the ring, but when it comes to John Cena, his in-ring WWE future is not quite certain at the moment, with him balancing his in-ring commitments with his commitments to his Hollywood career.